Choosing the right battery is vitally important for product quality, life-span and to ensure that nothing dangerous might happen when in use. Which is why it is better to choose the quality of a product over its price. As you can see the plastic around the power button has started to melt due to the overheating of the battery. The problem here is that being a cheaper power bank it contains a less reliable and poorly made Li-ion battery/Li-Polymer battery that has some deficiency. 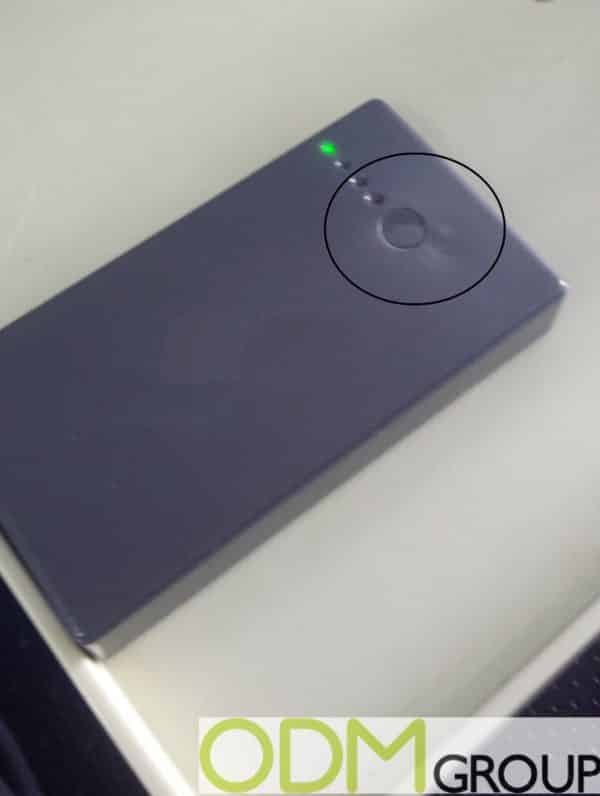 This means that they are easily prone to overheating when charged and used, and if the power banks IC is also malfunctioned, the battery itself like this might melt and even worse catch fire and even explode. Another disadvantage of cheaper promotional power banks is that their lifespan is also greatly reduced if they continue to operate at higher temperatures. Not ideal if you want customers to use your product for a long time without any issue. Cheaper alternatives have their hazards, for example the recent exploding hoverboard incident due to bad parts and unclear instructions. This led to consequences as reported on the news, damaging of many houses, catching fire, and hurting people. All factors you need to avoid when deciding if cheaper really is better. Why should you choose branded promotional power banks? With all of this in mind, it is always worth paying a little more for better quality. In this case, using branded Li-ion and Li-Polymer batteries are a safer alternative, will guarantee a longer product lifespan and high quality for peace of mind. These factors will ensure that melting of plastic and leakage of batteries in your promotional power banks will be near enough eliminated. At ODM we strongly recommend that you use Samsung battery power banks to reduce hazards and ensure that you get a high quality and safe product.